I’ve had this coat for ages. I go through phases of wearing it and not wearing it, but I’ve yet to go through a phase where I feel that I need to replace it. There’s something to be said for Burberry durability. How are your holidays going? I’m currently in New Mexico, where reality television has been replaced by the antics and strange interactions of a flock of chickens, three semi-feral cats, and a spunky Boston Terrier. I swear species cross-communicate, à la Charlotte’s Web. Needless to say, I can assure you I will have lots of photos to share after this trip. Love Ur whole outfit! Gorgeous shoes and bag! Great coat, I love the color! And I agree–my vintage Burberry coat just doesn't age. That coat is adorable! I does remind me of the little bear! Those shoes are amazing, I'd love to have them! I love duffle coats and toggles. Still hanging on to one from 3 years ago because I cannot find a replica. Love the navy! haha sometimes animals can be just as entertaining as reality tv. I love that jacket btw! I love your reference to paddington bear. This is so his coat. I love it. It looks so warm. It needs to be paired with something ultra girly now. That coat is fabulous! I love how youthful it looks! paddington bear was my favorite book ever growing up. 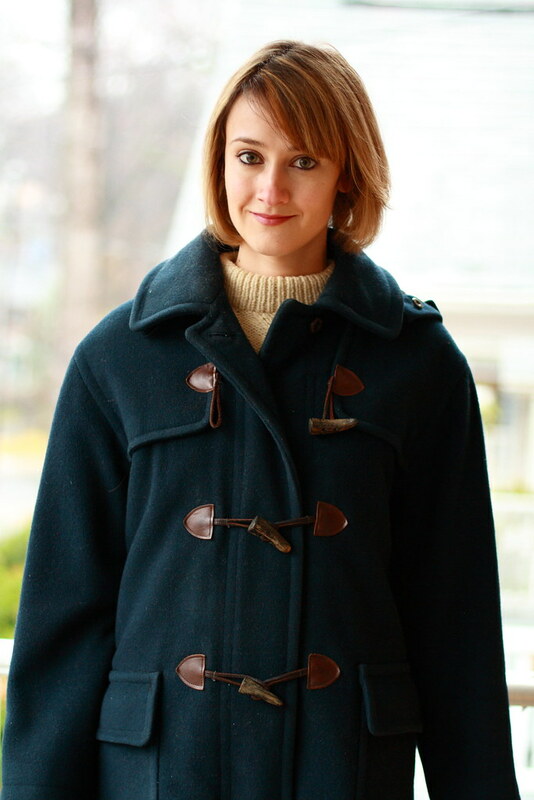 i love the coat and have always been fond of toggles ever since that book. very cute and it does remind me (in a good way) of Paddington – one of my fav books! P.S. When you leave comments now and i click on the high lighted "E" for your name it doesn't come up w/your blog info/link on your "about page" wasn't sure if you knew this…. I have every type of coat except a toggle one, this one is so cute and comfy looking! i adore these shoes – i had no idea that dr. martens made such gorgeous footwear! Fabulous coat – an eternal classic and you wear it well. You do look very paddington bear! 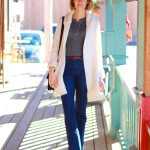 I love the title of this post and the coat! I'm loving your coat. Burberry has such a great reputation for their coats and trench jackets. I would love to own one. Also I'm excited to your photos from New Mexico. I hear it's so beautiful. Here's hoping you have no encounters with aliens in New Mexico. 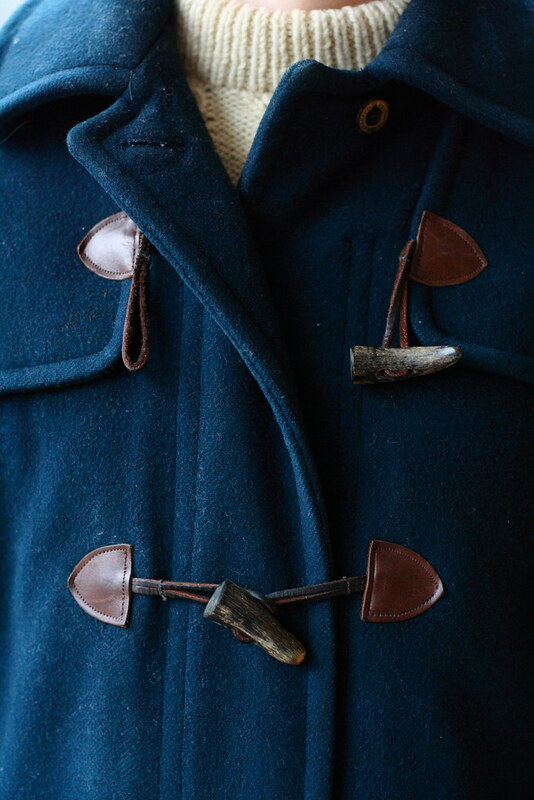 Everytime I see a coat with toggle buttons I can't help but think but Paddington Bear. Loved those books. Speaking of love…you're loafers are amazing. Who knew Dr. Marten had it in him? OMG. Most awesomest coat ever. And I'm seriously coveting your loafers. Too cute and too Paddington! Have a fab time in Mexico! I absolutely adore those loafers! That's a perfect post title. You look very cozy in your paddington-esque coat! the toggle coat is adorable! there are few things better than classic pieces you can wear forever that will wear forever. 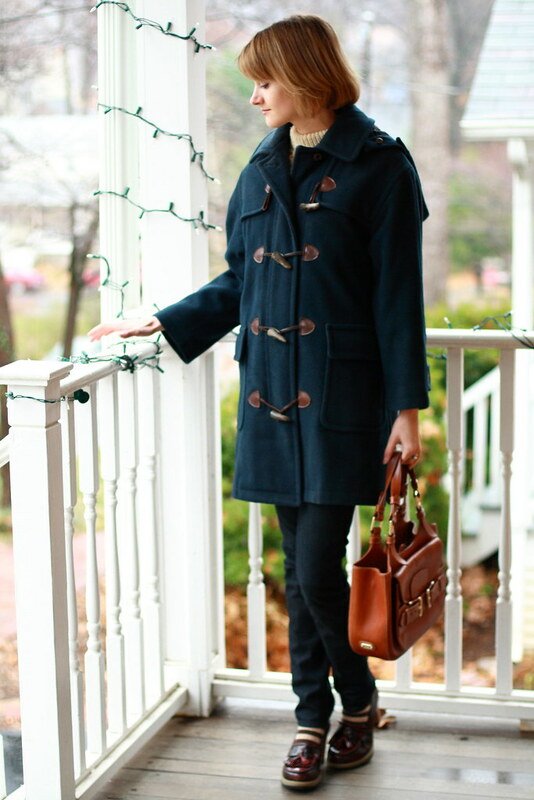 love that toggle buttoned coat. The color is great. 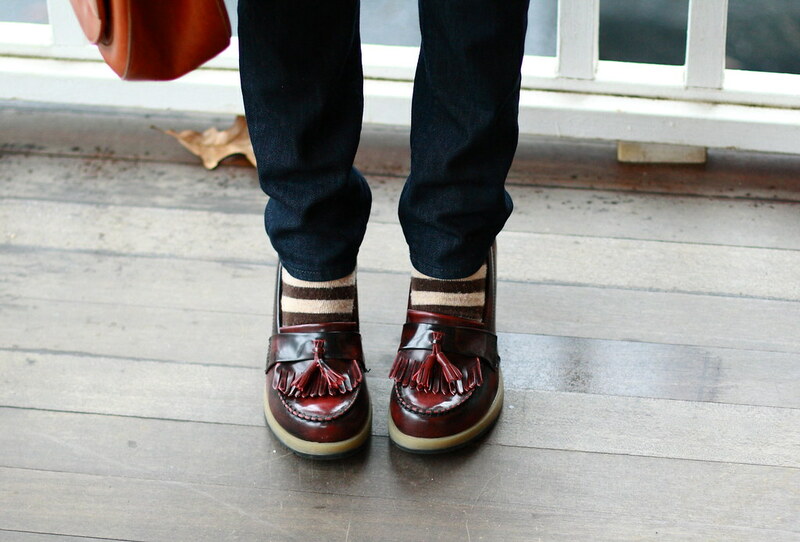 The loafers and the striped socks are so whimsical. lol. looking forward to the pictures. you looked mighty cosy in the coat and socks. toggle coats are some chic. but i love those doc martens the best! I'd take a flock of chickens over reality television any day! I adore the coat it looks so warm! i love those toggles! super cute. I like your coat. Have a nice holiday. BTW, having a Swarovski earring give away! Check it out & share 🙂 Happy Holidays. I hope you're enjoying your trip! Your coat increases my want for a toggle coat! love the coat and bag! 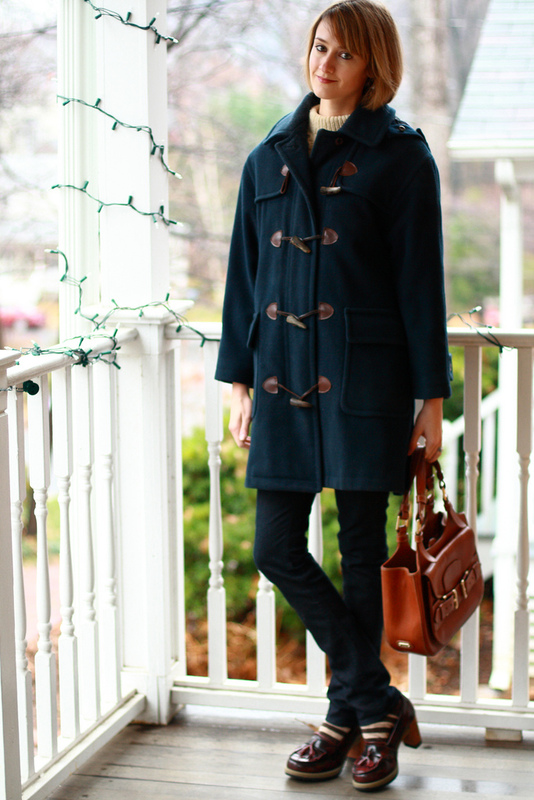 I love the coat and loafers, this is such a classic preppy look. I remember going to visit family in a country-eque town in Florida. Needless to say, it was hell :/ Can't wait to see the photos from the trip! Love your coat! Really gorgeous! Haha this title is perfect!!! I love toggle coats! I really like the color of yours! Very classic! ahh your coat is adorable! i love the color. very unique. I already commented on this lovely ensemble, but I wanted to let you know that I awarded you the "Stylish Blogger Award". Merry Christmas! Those loafers are utterly fantastic. And I love them with the striped socks!! I just found your blog, and I love it! 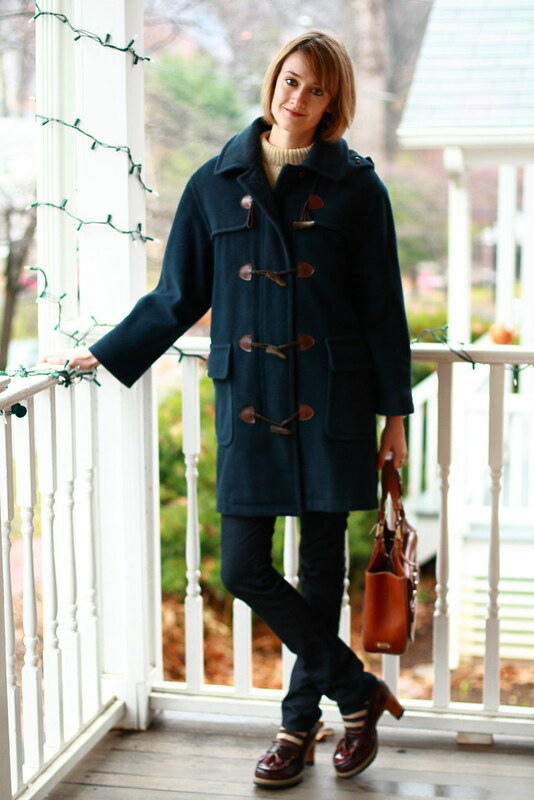 This coat is really cute and has some great buttons. I love those shoes as well. Very interesting. i do NOT have a burberry coat, so i am a little jealous. grumble grumble. lol!!! and i can't wait to see your pictures!!!! I love the striped socks… what a perfect touch! 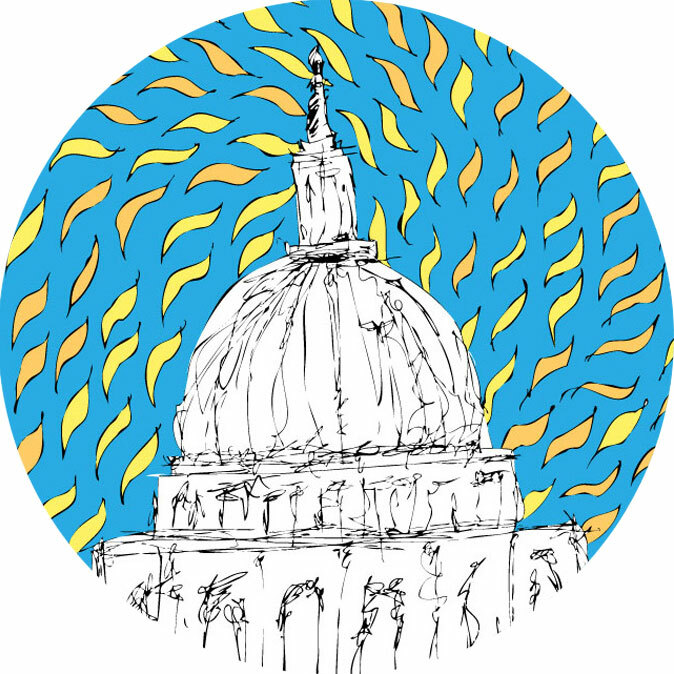 Enjoy NM – and have a very happy christmas. i straight away noticed your loafers, to me theyre the perfect shoe, just the right height and look super comfy! theyre a beautiful colour.